When reaching its limits for cost reduction, contact us. Our automatic friction welding machines will solve your problem in cost reduction. 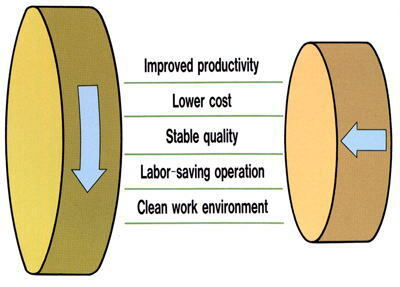 The friction welding is a simply and high productivity welding method. Two Work-pieces, one side is rotated and other side is fixed with clamp, use friction heating at the contact of two work-pieces with pressure and makes friction welding. Friction welding is an innovative type of welding that doesn't generate chips. Since it can help lower manufacturing cost, friction welding is ideal for companies fighting for survival in today's demanding economic conditions. Basic design enables easy combination with labor-saving or automated equipment. Widespread use of the latest electronics technology. Extensive lineup of special accessories enables selection of optimum processing methods (such as automatic loading & un-loading, delivery or QC) for a wide variety of products. Copyright © Sakae Industries Co., Ltd., All rights reserved.